Angina is chest pain that occurs when your heart doesn’t get enough oxygenated blood. It is also a very serious warning signal that you are at risk of having heart attack. 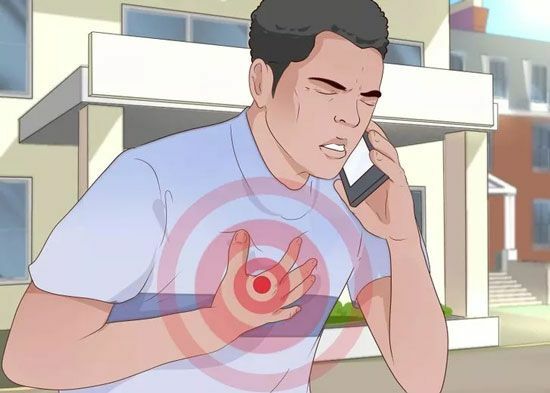 If you have chest pain, seek medical attention immediately and talk to your doctor about ways of reducing your pain and risk of a heart attack. 1. Call emergency responders if you could be having a heart attack. Angina itself can be a symptom or precursor to a heart attack. If you are unsure about whether the chest pain you are experiencing could be a heart attack, call emergency responders immediately. 2. Call emergency responders if you are a woman with abnormal symptoms. Women’s symptoms during heart attacks often differ from those of men. They may not have chest pain. However, it is still a medical emergency. 3. Call emergency medical responders if you are having an unstable angina. An unstable angina is often a sign of a heart attack. You may need immediate treatment to avert a heart attack. 4. Ask your doctor if you have a stable angina. This is the most frequent type of angina. 5. Discuss less common anginas with your doctor. Determining whether you have these anginas may help your doctor to determine what the underlying cause of your angina is. Tell your doctor before hand if you are pregnant, nursing, or think you could be pregnant, as this might affect your doctor's choices of which tests to give you. 6. Get additional tests if your doctor suggests it. Depending on your particular symptoms and medical history. 1. Ask your doctor about using medications for symptom relief. One commonly prescribed medication is glyceryl trinitrate. It causes your blood vessels to relax and widen. This increases the blood flow to your heart immediately and should relieve your pain within three minutes. 2. Use medications to prevent future episodes. There are many different possibilities for medications that your doctor may prescribe, depending on your symptoms and medical history. These medications are designed to prevent attacks over the long-term, rather than deal with an occurring or oncoming attack. Because some of these medications may interact with other prescription medicines, over-the-counter medications, herbal remedies, or supplements, it is important to tell your doctor about everything that you take. 3. Use medications to reduce your risks of heart attacks and strokes. People with angina are often at a high risk for a heart attack or stroke. 4. Talk to your doctor about surgery. If medication does not alleviate your symptoms, your doctor may recommend surgery in addition to medication. 1. Keep your arteries clear with a low-fat diet. Saturated and trans fats are particularly bad for your heart. Keep your fat intake down to 3 servings per day. A serving is actually a very small amount, like a tablespoon of butter. 2. Lower the burden on your heart with a low salt diet. Eating too much salt contributes to hypertension, or high blood pressure. 3. Satisfy your hunger with fruits and vegetables. Fruits and vegetables are low in fat and high in fiber and vitamins. A heart healthy diet should include 2 to 3 cups of fruit and 2 to 3 cups of vegetables each day. 4. Swap fatty meats for lean meats. Red meats like steaks and pork chops are often very fatty. Healthier alternatives are poultry and fish. You should eat no more than 6 ounces of meat per day. 5. Cut calories from alcohol. Drinking too much can increase your risk for obesity and burden your heart. If you drink a lot, you may find that quitting causes you to lose weight. When you do drink, try to stick to these guidelines. 6. Don’t harden or narrow your arteries through smoking. Smoking and chewing tobacco can damage your arteries making you more prone to angina, high blood pressure, heart attacks, and strokes. 7. Exercise if your doctor says it is ok. Do not start a new exercise program without talking to your doctor to see if your heart can handle it. However, if your doctor gives you the go ahead, it can help you to lower your blood pressure, reduce your cholesterol, and help keep your arteries clear. 8. Don't use dangerous or ineffective alternative medicine treatments. The National Institute for Health and Care Excellence (NICE) in Britain recommends against using the following alternative therapies.